audio installation, Oktogon, 6 October 2012, 8:00 p.m., 10 a.m. to 10 p.m.
radio drama (coproduction of HR3, The Image of Sound, editor in chief Evelina Turković), HR3, December 2012. Sound technician: Zoran Sajko (HR3), Ognjen Škrborić (Radio Beograd). Sound design: Milan Filipović (Radio Beograd). Actors: Vilim Matula, Maja Katić, Petar Cvirn, Nikša Marjanović, Dejan Bulajić, Dejana Jočović, Luka Mijatović, Slobodan Đukić. Student protests and blockades, based on the principle of plenum as a direct democratic student body – such as those organized in Belgrade in 2011 or at the Faculty of Philosophy in Zagreb in 2009 – are an increasingly present phenomenon at the universities of Belgrade, Zagreb, Ljubljana, Rijeka, Novi Sad, and other cities in this region. The key goals of these protests are related to the possibility of achieving publicly financed education that would be accessible to all, as well as to defend the autonomy of the university and student self-organization. 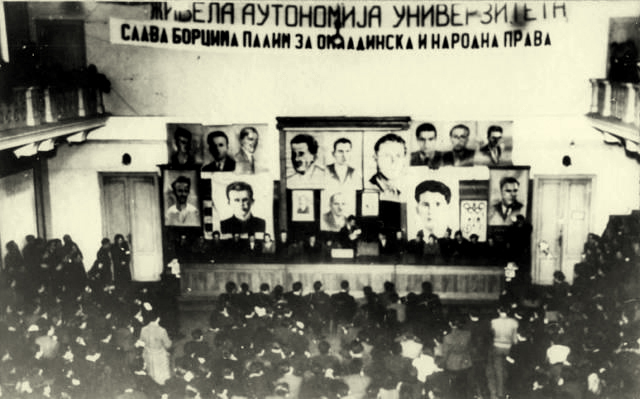 Even though it may not be a universally known fact, student riots based on the principles of direct democracy were also a very popular form of organization in the advanced, that is, revolutionary student movements at the universities of Belgrade and Zagreb between the two World Wars, especially in the 1930s. The capitalist regime and the overall fascistization of the society are only some of the possible similarities that can be observed with regard to the social, political, and economic situation of today’s students. The importance of that struggle in the history of student organization are attested by the historical data about the number of students from the University of Belgrade who were involved in those advanced student movements. The project called On Solidarity: Why It Is Important to Reflect on the Student Protests of the 1930s is a result of research carried out in Belgrade and Zagreb during the years of 2011 and 2012, as well as the previously organized public debate and exhibition in Belgrade. Its basic aim is to actualize a part of the forgotten history of revolutionary student riots in the Kingdom of Yugoslavia, and to emphasize the students’ interconnectedness, struggle, communication, and solidarity, which often exceeded the limits of the student movement. The audio-visual installation is based on various archival materials collected in Belgrade and Zagreb (student memos and leaflets from the 1930s, media coverage of plenums and protests, police records, newspaper articles, photographs, etc.) which speak about the repression those student movements had to face in their struggle. Kontekst collective is autonomus organization whose work represents a process of interconnecting critical theory and practice, field of art and culture with wider social action.